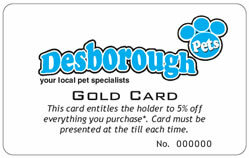 Aside from our special offers, Desborough Pets is pleased to offer customers our loyalty scheme, the “GOLD CARD”. 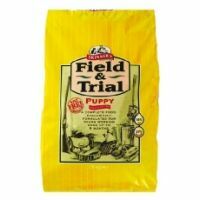 It is quick, easy and FREE to join and it entitles the card holder to a 5% discount on everything they puchase, either in-store or online (Discount excludes complete dog and cat foods and gift vouchers). Our computor will automatically calculate the discount on eligable products when the card is presented at the till in-store or type the word 'goldcard' in the coupon box at the view basket page of this site to discount all eligible products. It is really quick and easy to apply, simply pop into any of our stores and fill in an application form or fill out the form below, click 'submit' and we will send you your card! !